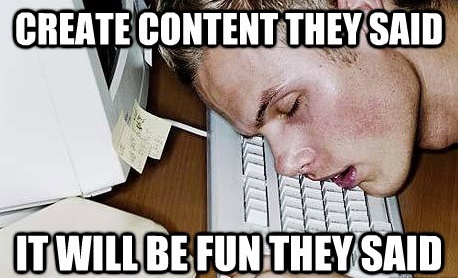 Even though there is an abundance of it out there, it’s not easy to create or even “buy” great content. Why? Because now you need top quality content that can cut through all of the other stuff that is already out there—the stuff that’s already been read or is just plain overdone. So when you hear marketers talk about content this and content that, it’s not just about the anxiety of having to produce a catchy one-liner or new product tagline. These strategies sufficed in the the “Mad Men” days and could complete your marketing initiatives for that quarter, but today’s marketing landscape requires more. Content now, especially in the digital world, has taken on a new meaning. Content creation refers to the blogs, whitepapers, eBooks, tip sheets, infographics, landing pages, videos, and social media posts that are engaging, educational, and interesting enough to push new prospects down the lead funnel and into your customer base. Content in emails is supposed to be clever but also deliver a message that speaks directly to your customers’ needs or offers a solution to their problems. Of course marketing still has a creative side. It can be glamourous with eye-catching images. It still should be concise and clean. But these factors can’t be the only components of your strategy if you plan to to stay relevant in a world that is consumed by and heavily relies on technology and instant access to information. Unfortunately, I can’t give you the solution to all your marketing problems with a blog about content. I wish I could sum it up in three pretty and simply worded bullet points. Quality, effective content creation is a full commitment that takes time, resources, and careful consideration of your current brand, target, and goals. If you are ready to use content to rank higher in Google, to inform prospects, to illustrate your company culture, to increase brand awareness and to delight and engage customers (and much much more), the good news is that you have taken the first step. You’re here educating yourself by reading this blog post. Give yourself a pat on the back. Don’t stop here though. You’re ready for the next step. Download our E-book below now to learn more about the “Content Monster,” or give us a call!